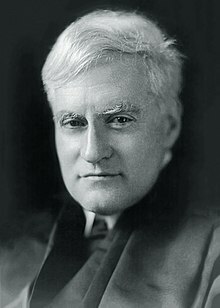 Benjamin Nathan Cardozo (24 May 1870 – 9 July 1938) was a long-time Justice of the Court of Appeals of New York, where his opinions included many declarations that would become famous in legal circles; he was appointed to the Supreme Court of the United States in 1932. The law has outgrown its primitive stage of formalism when the precise word was the sovereign talisman, and every slip was fatal. It takes a broader view to-day. A promise may be lacking, and yet the whole writing may be "instinct with an obligation," imperfectly expressed. If that is so, there is a contract. In re Rouss, 221 N.Y. 81, 84 (N.Y. 1917). In re Rouss, 221 NY 81, 91 (N.Y. 1917). The defendant styles herself "a creator of fashions." Her favor helps a sale. Manufacturers of dresses, millinery and like articles are glad to pay for a certificate of her approval. The things which she designs, fabrics, parasols and what not, have a new value in the public mind when issued in her name. She employed the plaintiff to help her to turn this vogue into money. Wood v. Lucy, Lady Duff-Gordon, 222 N.Y. 88, 91; 118 N.E. 214 (N.Y. 1917). This opening paragraph has been debated among legal practitioners, some of whom take its tone to be a sly rebuke by Cardozo of a profession which he considered to have an exaggerated influence. Wood v. Lucy, Lady Duff-Gordon, 222 N.Y. 88, 91; 118 N.E. 214 (N.Y. 1917). Danger invites rescue. … The wrongdoer may not have foreseen the coming of a deliverer. He is accountable as if he had. Wagner v. International Railway Co., 232 N.Y. 13 (N.Y. 1926), setting forth the rescue doctrine which holds negligent parties liable not only for injury to the victim, but to those who attempt to rescue the victim. Fulfillment may fall short of expectation. At least there has been gained a foothold from which occasion can be seized. Walton Water Co. v. Village of Walton, 238 N.Y. 46, 50 (1924). Richard v. Credit Suisse, 242 N.Y. 346, 351 (N.Y. 1926). The whole problem of the relation between parent and subsidiary corporations is one that is still enveloped in the mists of metaphor. Metaphors in law are to be narrowly watched, for starting as devices to liberate thought, they end often by enslaving it. We say at times that the corporate entity will be ignored when the parent corporation operates a business through a subsidiary which is characterized as an 'alias' or a 'dummy.'... Dominion may be so complete, interference so obtrusive, that by the general rules of agency the parent will be a principal and the subsidiary an agent. Berkey v. Third Avenue Railway, 244 N.Y. 84, 94, 155 N.E. 58, 61 (N.Y. 1926). Sometimes misquoted as referring to "figures of speech" rather than metaphors, or with other minor variations. Not honesty alone, but the punctilio of an honor the most sensitive, is then the standard of behavior. Meinhard v. Salmon, 249 N.Y. 458, 164 N.E. 545 (N.Y. 1928), describing the fiduciary duties inherent in a partnership. Ultramares Corp. v. Touche, 255 N.Y. 170, 179, 174 N.E. 441, 444 (N.Y. 1931). Expediency may tip the scales when arguments are nicely balanced. Prophecy, however honest, is generally a poor substitute for experience. West Ohio Gas Co. v. Public Utilities Commission (No.2), 294 U.S. 79, 82, (1935). Price security, we are told, is only a special form of sanitary security; the economic motive is secondary and subordinate; the state intervenes to make its inhabitants healthy, and not to make them rich. On that assumption we are asked to say that intervention will be upheld as a valid exercise by the state of its internal police power, though there is an incidental obstruction to commerce between one state and another. This would be to eat up the rule under the guise of an exception. Economic welfare is always related to health, for there can be no health if men are starving. Let such an exception be admitted, and all that a state will have to do in times of stress and strain is to say that its farmers and merchants and workmen must be protected against competition from without, lest they go upon the poor relief lists or perish altogether. To give entrance to that excuse would be to invite a speedy end of our national solidarity. The Constitution was framed under the dominion of a political philosophy less parochial in range. It was framed upon the theory that the peoples of the several states must sink or swim together, and that in the long run prosperity and salvation are in union and not division. Due process is a growth too sturdy to succumb to the infection of the least ingredient of error. Roberts v. New York, 295 U.S. 264, 278 (1935). Of that freedom one may say that it is the matrix, the indispensable condition, of nearly every other form of freedom. Palko v. Connecticut, 302 U.S. 319, 327, (1937). Justice is not to be taken by storm. She is to be wooed by slow advances. Substitute statute for decision, and you shift the center of authority, but add no quota of inspired wisdom. Lecture at Yale University Law School (1923) as quoted in The American Journal of International Law Vol. 29 (1935), p. 32. The repetition of a catchword can hold analysis in fetters for fifty years or more. Mr. Justice Holmes, 44 Harv. L. Rec. 682, 289 (1931). "Law and Literature" in Law and Literature and Other Essays and Addresses (1931), p. 9. On types of judicial writing, in "Law and Literature" in Law and Literature and Other Essays and Addresses (1931), p. 10. "The Game of the Law" In Law and Literature and Other Essays and Addresses (1931), p. 163. The judicial process is one of compromise, a compromise between paradoxes, between certainty and uncertainty, between the literalism that is the exaltation of the written word and the nihilism that is destructive of regularity and order. Jurisprudence (address before the New York State Bar Association Meeting, Jan. 22, 1932), republished in Margaret E. Hall, ed., Selected Writings of Benjamin Nathan Cardozo (1947), p. 25. In truth, I am nothing but a plodding mediocrity — please observe, a plodding mediocrity — for a mere mediocrity does not go very far, but a plodding one gets quite a distance. There is joy in that success, and a distinction can come from courage, fidelity and industry. As quoted in Nine Old Men (1936) by Drew Pearson and Robert Sharon Allen, p. 221. Excerpt from speech delivered at the 74th commencement of the Albany Law School on June 10, 1925, which is reproduced on a gigantic plaque on the west side (facing the setting sun, as if to say, "Go West, young man.") of the UC Berkeley School of Law's main building, Boalt Hall. There comes not seldom a crisis in the life of men, of nations, and of worlds, when the old forms seem ready to decay, and the old rules of action have lost their binding force. The evils of existing systems obscure the blessings that attend them; and, where reform is needed, the cry is raised for subversion. Again and again, the altruist has arisen in politics, has bidden us share with others the product of our toil, and has proclaimed the communistic dogma as the panacea for our social ills. So today, amid the buried hopes and buried projects of the past, the doctrine of communism still lives in the minds of men. Under stress of misfortune, or in dread of tyranny, it is still preached in modern times as Plato preached it in the world of the Greeks. Yet it is indeed doubtful whether, in the history of mankind, a doctrine was ever taught more impracticable or more false to the principles it professes than this very doctrine of communism. In a world where self-interest is avowedly the ruling motive, it seeks to establish at once an all-reaching and all-controlling altruism. In a world where every man is pushing and fighting to outstrip his fellows, it would make him toil with like vigor for their common welfare. In a world where a man's activity is measured by the nearness of reward, it would hold up a prospective recompense as an equal stimulant to labor. … In the future, when the remoteness of his reward shall have weakened the laborer's zeal, we shall be able to judge more fairly of the blessings that the communist offers. It is the refutation alike of communism and socialism that they thwart the instinct of expansion; that they substitute for individual energy the energy of the government; that they substitute for human personality the blind, mechanical power of the State. The one system, as the other, marks the end of individualism. The one system, as the other, would make each man the image of his neighbor. The one system, as the other, would hold back the progressive, and, by uniformity of reward, gain uniformity of type. I can look forward to no blissful prospect for a race of men that, under the dominion of the State, at the cost of all freedom of action, at the cost, indeed, of their own true selves, shall enjoy, if one will, a fair abundance of the material blessings of life. … Into that prison of socialism, with broken enterprise and broken energy, as serfs under the mastery of the State, while human personality is preferred to unreasoning mechanism, mankind must hesitate to step. We may try to see things as objectively as we please. None the less, we can never see them with any eyes except our own. There is in each of us a stream of tendency, whether you choose to call it philosophy or not, which gives coherence and direction to thought and action. Judges cannot escape that current any more than other mortals. All their lives, forces which they do not recognize and cannot name, have been tugging at them — inherited instincts, traditional beliefs, acquired convictions; and the resultant is an outlook on life, a conception of social needs. … In this mental background every problem finds it setting. We may try to see things as objectively as we please. None the less, we can never see them with any eyes except our own. The great generalities of the constitution have a content and a significance that vary from age to age. It is well enough to say that we shall be consistent, but consistent with what? . . . The origins of the rule? The course and tendency of development? With logic or philosophy? With the fundamental conceptions of jurisprudence? All these loyalties are possible. All have sometimes prevailed. My analysis of the judicial process comes then to this, and little more: logic, and history, and custom, and utility, and the accepted standards of right conduct, are the forces which singly or in combination shape the progress of the law. Which of these forces dominate depends largely upon the comparative importance or value of the social interests that will be thereby promoted or impaired. … The most fundamental social interest is that law shall be uniform and impartial. … Uniformity ceases to be a good when it becomes uniformity of oppression. If you ask how he is to know when one interest outweighs another, I can only answer that he must get his knowledge just as the legislator gets it, from experience and study and reflection; in brief, from life itself. I am ready to concede that the rule of adherence to precedent, though it ought not to be abandoned, ought to be in some degree relaxed. I think that when a rule, after it has been duly tested by experience, has been found to be inconsistent with the sense of justice or with the social welfare, there should be less hesitation in frank avowal and full abandonment. … That court best serves the law which recognizes that the rules of law which grew up in a remote generation may, in the fullness of experience, be found to serve another generation badly, and which discards the old rule when it finds that another rule of law represents what should be according to the established and settled judgment of society. We like to picture to ourselves the field of law as accurately mapped and plotted. We draw our little lines, and they are hardly down before we blur them. As in time and space, so here. Divisions are working hypotheses, adopted for convenience. … So also the duty of a judge becomes itself a question of degree, and he is a useful judge or a poor one as he estimates the measure accurately or loosely. He must balance all his ingredients, his philosophy, his logic, his analogies, his history, his customs, his sense of right, and all the rest, and adding a little here and taking out a little there, must determine, as wisely as he can, which weight shall tip the scales. The judicial process, as was said at the outset of these lectures, is a process of search and comparison, and little else. I was much troubled in spirit, in my first years upon the bench, to find how trackless was the ocean on which I had embarked. I sought for certainty. I was oppressed and disheartened when I found that the quest for it was futile. I was trying to reach land, the solid land of fixed and settled rules, the paradise of a justice that would declare itself by tokens plainer and more commanding than its pale and glimmering reflections in my own vacillating mind and conscience. I have spoken of the forces of which judges avowedly avail to shape the form and content of their judgments. Even these forces are seldom fully in consciousness. They lie so near the surface, however, that their existence and influence are not likely to be disclaimed. But the subject is not exhausted with the recognition of their power. Deep below consciousness are other forces, the likes and the dislikes, the predilections and the prejudices, the complex of instincts and emotions and habits and convictions, which make the man, whether he be litigant or judge. The great tides and currents which engulf the rest of men do not turn aside in their course and pass the judges by. I sometimes think that we worry ourselves overmuch about the enduring consequences of our errors. They may work a little confusion for a time. In the end, they will be modified or corrected or their teachings ignored. The future takes care of such things. In the endless process of testing and retesting, there is a constant rejection of the dross, and a constant retention of whatever is pure and sound and fine. Magic words and incantations are as fatal to our science as they are to any other. … We seek to find peace of mind in the word, the formula, the ritual. The hope is an illusion. In our worship of certainty we must distinguish between the sound certainty and the sham, between what is gold and what is tinsel; and then, when certainty is attained, we must remember that it is not the only good; that we can buy it at too high a price; that there is danger in perpetual quiescence as well as in perpetual motion; and that a compromise must be found in a principle of growth. Magic words and incantations are as fatal to our science as they are to any other. Methods, when classified and separated, acquire their true bearing and perspective as a means to an end, not as ends in themselves. We seek to find peace of mind in the word, the formula, the ritual. The hope is an illusion. I do not underrate the yearning for mechanical and formal tests. They are possible and useful in zones upon the legal sphere. The pain of choosing is the pain of marking off such zones from others. It is a pain we must endure, for uniformity of method will carry us upon the rocks. The curse of this fluidity, of an ever shifting approximation, is one the law must bear, or other curses yet more dreadful will be invited in exchange. Code is followed by commentary, and commentary by revision, and thus the task is never done. The reconciliation of the irreconcilable, the merger of antitheses, the synthesis of opposites, these are the great problems of the law... We have the claims of stability to be harmonized with those of progress. We are to reconcile liberty with equality, and both of them with order. The property rights of the individual we are to respect, yet we are not to press them to the point at which they threaten the welfare or the security of the many. We must preserve to justice its universal quality, and yet leave to it the capacity to be individual and particular. The state in commissioning its judges has commanded them to judge, but neither in constitution nor in statute has it formulated a code to define the manner of their judging. The pressure of society invests new forms of conduct in the minds of the multitude with the sanction of moral obligation, and the same pressure working upon the mind of the judge invests them finally through his action with the sanction of the law. It comes down to this. There are certain forms of conduct which at any given place and epoch are commonly accepted under the combined influence of reason, practice and tradition, as moral or immoral. … Law accepts as the pattern of its justice the morality of the community whose conduct it assumes to regulate. In saying this, we are not to blind ourselves to the truth that uncertainty is far from banished. Morality is not merely different in different communities. Its level is not the same for all the component groups within the same community. A choice must still be made between one group standard and another. We have still to face the problem, at which one of these levels does the social pressure become strong enough to convert the moral norm into a jural one? All that we can say is that the line will be higher than the lowest level of moral principle and practice, and lower than the highest. The law will not hold the crowd to the morality of saints and seers. It will follow, or strive to follow, the principle and practice of the men and women of the community whom the social mind would rank as intelligent and virtuous. A judge is to give effect in general not to his own scale of values, but to the scale of values revealed to him in his readings of the social mind. … Objective tests may fail him, or may be confused as to bewilder. He must then look within himself. Liberty in the most literal sense is the negation of law for law is restraint, and the absence of restraint is anarchy. On the other hand, anarchy by destroying restraint would leave liberty the exclusive possession of the strong or the unscrupulous. What has once been settled by a precedent will not be unsettled overnight, for certainty and uniformity are gains not lightly sacrificed. Above all is this true when honest men have shaped their conduct on the faith of the pronouncement. They do things better with logarithms. Commenting on the uncertainty of the law. Bills of rights give assurance to the individual of the preservation of his liberty. They do not define the liberty they promise.